Red in spring, purple in summer, and rich orange in autumn! One of the most charming plants for spring-to-fall beauty, 'Royal Purple' is clothed in incomparable foliage that opens warm red, then deepens to a rich purple in summer and finally burnishes golden-orange in fall! Feathery purple plumes of flowers appear in midsummer, topping the stunning leaves with soft clouds of color! 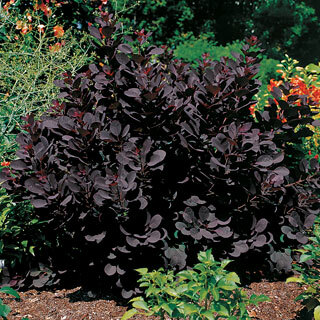 10 feet high and wide, this Smoke Bush is the perfect back-of-the-border standout, accent planting, or barrier. Its rich, lush color simply glows in the garden, and you'll love the new look with each passing season! Best grown in full sun for the widest color range, this plant is easy to care for, asking only well-drained soil and lots of light to continue its show for many years to come in your garden. Hardy in zones 4-8. Currently shipping in 4 inch pots.